The South by Southwest Interactive Innovation Awards show off some of the best projects the show has to offer. Here's a look at the coolest ones. South by Southwest was the birthplace of Twitter, Foursquare, and Meerkat, the now-defunct app that kicked off the social livestreaming phenomenon. That’s why creators flock to Austin every year with hopes of striking it rich, and a handful of startups are selected to compete in the South by Southwest Interactive Innovation Awards. Before the winners are announced at the end of the conference, showgoers get to check out live demos during the Finalist Showcase. There are a few “Fitbit for dog” devices on the market already, but the Link Collar offers more than just health and activity tracking. Yes, it does track your dog’s activity so you can see what she’s up to when you’re not at home, but it also has a built-in temperature sensor that notifies you if an area is too hot or too cold for your dog to handle. It taps into the American Kennel Club’s database to give you health tips for your dog based on her size, breed, and age. Musicians know how tough it can be to squeeze in some practice time, especially if your home isn’t sound-proofed or if you can only practice late at night. The Music Room is a MIDI controller that, when paired with an HTC Vive headset, lets you play music without having to even touch an instrument. The software will mimic an instrument’s sound as you go through the motion of playing, which you’ll hear through a set of headphones. We watched a drumming demo, and thanks to VR, musicians can see the virtual instruments they’re playing, even if they’re not real. The most creative demo we saw, DuoSkin, is a research project between MIT and Microsoft. 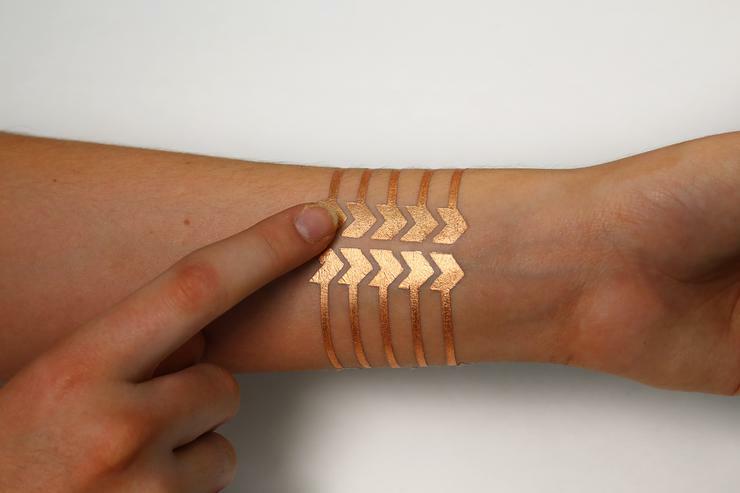 DuoSkins are essentially tricked-out flash tats, those trendy metallic temporary tattoos, but they pack touch-based sensors to bring wearable technology to your skin. We saw them work as an NFC chip, activate a phone’s swipe-to-unlock feature, and act as a mini trackpad paired to a mobile device. DuoSkins are made from an inexpensive metallic gold foil, making them a cool way to bring wearable tech into the DIY space.